As president of HCA Southwest, one of three operating groups for Nashville, Tenn.-based HCA, the largest hospital system in the world, Jon Foster has a hand in helping millions of people each year. He leads a team of more than 50,000 professionals and is responsible for 48 of HCA's hospital operations in Texas, Colorado, Oklahoma and Kansas, which combine for annual net revenues in excess of $11 billion. "In healthcare, we're fortunate to have a life-giving mission, and each day brings a new and varied set of issues and opportunities -- that's what keeps it interesting," says Foster, who is quick to deflect praise to the many healthcare professionals who work with him. "We are fortunate to have a highly skilled team of leaders capable of effectively navigating through many regional issues. Healthcare is very locally nuanced, and our hospitals have different regulatory, competitive and budgetary challenges which make local and regional leadership so paramount." As a proven leader in healthcare, Foster has helped shape health policy at the state and national levels. In addition to providing expert testimony for the U.S. House of Representatives Ways and Means Committee, he has served as chairman of the Texas Hospital Association Board and as a member of the American Hospital Association Regional Policy Board. 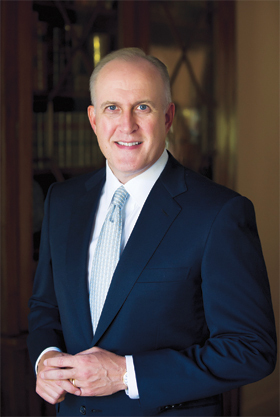 Prior to his current position, Foster served as president for the HCA Central and West Texas Division from 2006-11 and as president and CEO of St. David's HealthCare in Austin beginning in 2001, where he continues to serve as vice chairman of the board of trustees. Under his leadership, St. David's HealthCare experienced a decade of substantial growth and expansion, received the prestigious Texas Award for Performance Excellence, the highest quality award given in the state, and was named Texas Employer of the Year by the Texas Workforce Commission. Raised in a Christian home, Foster spent his early years in Germany, where his parents served as missionaries in Berlin, before moving back to the United States where his father served as a pastor of several churches in Ohio. "All my life, I've observed the countless sacrifices my parents made in service to others. I watched them tirelessly give of themselves to that calling. There's no doubt that continues to shape the way I view what's ultimately important in life," Foster says. Foster's older brother, Jim, attended Baylor and influenced Jon to do the same. At Baylor, Foster was in the Sigma Alpha Epsilon fraternity, and like most Baylor students, he developed lifelong friendships he still cherishes today. "My time at Baylor opened my eyes to the many opportunities available to me beyond what I may have originally imagined as a first-semester freshman," he says. "In fact, a great deal of whatever I may have had the good fortune to do in my career can be traced back to Baylor and how my years there influenced me." While at Baylor, Foster dated a fellow Baylor student whose father was a physician from East Texas. The physician took an interest in Foster's future and introduced him to the healthcare profession, guided him in the post-graduate academic requirements necessary for a healthcare career, and facilitated introductions with several hospital executives across Texas. "He is the one ultimately responsible for encouraging me to pursue a career in hospital and healthcare leadership," says Foster. "For that, I will always be appreciative." Before moving to Austin, Foster served as the executive vice president of operations for the Baptist Health System of East Tennessee. While there, he led the health system's operations to the most successful performance results in the organization's 50-year existence. His career began in 1986 at the Methodist Healthcare System in Houston, where he served until 1991. Every hospital or health system where Foster has been CEO has received national awards for its level of clinical care and service. Individually, Foster's contributions to healthcare also received national recognition when, in 2000, the 30,000-member American College of Healthcare Executives awarded Foster the Robert S. Hudgens Award recognizing him as the "Young Healthcare Executive of the Year" for the U.S. and Canada. He also holds the distinction of being one of only a few executives in the country who advanced to Fellowship status in the American College of Healthcare Executives at the age of 35. Foster, who after Baylor earned his master's in healthcare management from Trinity University, has this advice for students considering a career in health leadership. "Leading a team of people who daily dedicate themselves to the care and improvement of human life is one of the most gratifying and noble professions one can choose," he says. "There are numerous challenges, to be sure, but there are few professions that provide more opportunity to positively impact the lives of millions of people." Outside of his vocational responsibilities, Foster has served on numerous national and state-level boards, including positions on the Regents Council for the American College of Healthcare Executives, on the board of trustees of HealthONE in Denver, Colorado, as well as the Methodist Healthcare System Board in San Antonio, Texas, and on the Hankamer School of Business Advisory Board at Baylor University. In addition, he has been an active member of YPO (Young Presidents' Organization) International. As demanding as his work can be, Foster makes his family the higher priority and has managed to find a good balance of work and home life. He is a devoted husband to his wife of 22 years, Laura. They enjoy traveling together and being actively involved in the lives of their two daughters, Haley and Lindsey.